There are many times when an inspection can give you an advantage. 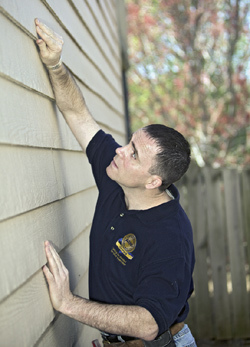 If you are buying a home or having a home built, getting a home inspection means you know about any problems and their solutions before you move in. If you are selling a home, getting a home inspection means you know you are complying with full disclosure laws, and means you can consider selecting contractors rather than waiting for the buyer to do so. If you have recently purchased a new home from a builder and the one year or a 2- 10 "builder warranty" is about to expire, a home inspection by a professional can let you know whether the builder/contractor did the job correctly. My job as your professional home inspector is to alert you, to the extent possible, to unknown problems and potential environmental hazards in your current or potential house. Just because some of these hazards may be invisible, this does not mean they call for less vigilance on your part. Mine is a non-invasive visual inspection of your property. While I may be able to alert you to possible problems, my basic inspections are no substitutes for specialized contaminant testing.